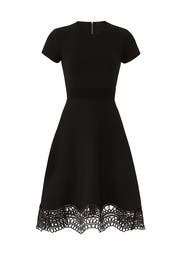 A scalloped lace hem provides a sweet finish to this Ted Baker London dress that's ready for anything. Black knit (53% Viscose, 44% Polyamide, 3% Elastane). Hourglass. Short sleeves. Crew neckline. Back zipper closure. 38" from shoulder to hemline. Imported. I love Ted Baker's designs but the dresses never fit me!! The zipper doesn't lie flat no matter which size I try. I usually wear an 8 or sometimes a 10. The 4 in this dress was too loose and long for me. It would be best if you're tall and have a flat stomach. 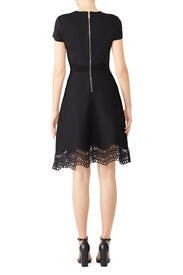 This was a pretty dress and the lace detail along the bottom is gorgeous but the zipper down the back causes the fabric to bunch in a weird way and it's just overall too big across the back. It made a weird ripple of fabric down the back that did not look right so I never wore this. This dress was so cute and comfortable to wear. It had a lot of stretch so I could've gone down a size. Such a beautiful dress, material was thicker so great for winter wear. Lace looks stunning. 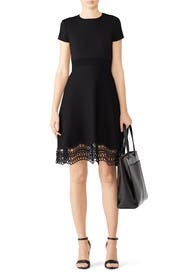 LBD you can dress up or down! This is so cute. Incredibly quality but runs very big. The two was big on me and I'm a four. 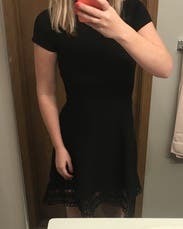 Rented this and wore it to a work event! Pairs well with tights and heels or tights and black boots for more casual. Fits really well! Nice fabric. I don't love the exposed zipper down the back but still overall great dress! So easy to wear. So comfortable. Looks so polished. I wore this to a post wedding brunch and got tons of compliments. Probably could have sized down one more because the material has lots of give. If you have a brunch or baby shower, bridal shower, etc to attend, it's a perfect fit. I rented this for a department holiday party, and it was just the right style when dressed up with fun earrings. It definitely runs large - I'm normally an 8, wore the equivalent of a 6, and it was still a little big on me. It's a great piece to pair with colorful shoes and accessories, would rent a size down next time. I always go up one size in Ted Baker and this was no exception. This dress was classic and comfortable. Loved the modest neckline and sleeves and the cute lace trim at the bottom. Fit very well on my petite frame - not overwhelming and waist hit in a great place. Great choice. Loved the material this dress is made of. It's a heavy high-quality fabric that fits like a glove. The dress was dressy enough for a party, but understated enough to wear to work first. The length was perfect too - a couple inches above the knee. Received many compliments on this dress. Form fitting top makes this best from trim ladies. This dress was nothing special in person. 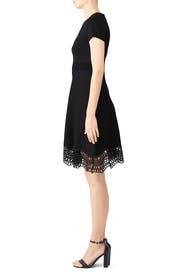 I sized up to a 3 based on the comments/reviews but it was a mistake-- smaller size would have been better but still not a super interesting dress. Amazing dress! Absolutely gorgeous fabric. Will be adding this to my list of possible re-orders. 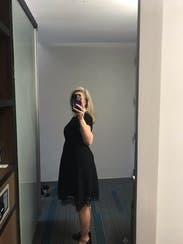 It was a cute little black dress. Gorgeous- pay attention to size! Ted Baker does not run big- it has a totally different sizing system altogether! Pay attention to the size chart and you should get a dress that looks amazing! This dress was comfortable, cute, and classy! Tons of compliments at work! I wore this for a fundraiser I hosted. 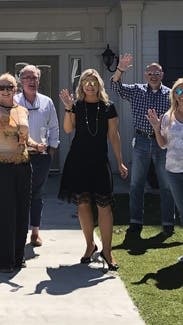 It was dressy but easy to run around in as I was all over the place managing the fundraiser.